Kidical Mass PDX – Page 6 – Awesome bike rides to cool Portland stuff! Plus kids! On April 28, join Kidical Mass a little further east for a relaxed family ride from Hancock Park (near Jason Lee Elementary and Rocky Butte) to Glenhaven Park for a snack and playtime, and then looping back to Hancock Park. Both parks include playgrounds, plus we’ll cruise through the Rose City Golf Course on our way. SUGGESTION: Bring a kite if you have one! There is lots of open space at Glenhaven Park. We’ll bring materials to make paper bag kites, too. We will stay together as a group and follow all traffic safety laws. Helmets are required for children and encouraged for adults. Kids riding their own bikes should be able to ride in a more or less straight line, stop and start as necessary, and follow verbal directions. This month we ride a wee bit earlier than usual, but it’s ok ’cause we’ll be joining up with the Saint Agatha/ Sellwood-Moreland Neighborhood St Patrick’s Day Parade. Wear Green, decorate your bike, and bring a friend. Note that the date is 1 week before St Patrick’s Day. Before the parade we’re going to have a pre-parade bike decorating party at the Sellwood Park Playground (SE 7th & Lexington). Decorating starts at 10:30am. We’ll have some bike decorations on hand but folks are encouraged to bring something to contribute to the decoration pool. At 11:30am we’ll ride to the parade staging area at Saint Agatha’s Church (7983 SE 15th, 97202). The Parade starts from St Agatha’s at 12 noon. The ride will go at parade speed and we will stay together as the Kidical Mass group. All types of bicycles and age of riders welcome. This will be a great ride for kids to ride their own pedal or balance bikes. Kiddos on bikes should be able to ride a relatively straight line, follow verbal instructions, and stop/start when necessary. Also, kids must wear a helmet per Oregon law. The Kidical Mass ride officially ends with the parade but since you’ll already be there you and yours may as well stick around and enjoy the festivities of the Saint Patrick’s Day Festival. There’ll be an old-fashioned carnival and Irish themed entertainment. The Festival goes until 5pm. To kick things off we’ll meet up in North Portland for a coffee/tea social. After socializing we’ll ride bikes in a family sort of way to SCRAP and make bird feeders out of milk cartons (BYO carton). As a bonus we’ll have a bird expert on hand to tell us a little about the birds we might attract with our new feeders. The Kidical Mass ride on February 18th will be a triple header of sorts… an indoor activity at each end with a ride in the middle. Coffee/tea social kicks off at 12 noon. We ride at 1:15. This is a family friendly bike ride. We stay together and ride slowly enough for kids to ride on their own. We will be on the road, so kids should be able to follow verbal instructions, ride a straight line, and stop/start when necessary. Kids must wear helmets and be accompanied by their grown-ups. Bring a lock to secure your bike. Bring some sort of milk jug, juice carton, or water bottle to make into a bird feeder at the SCRAP craft room. We’ll have an example or 2 on hand to demonstrate the general idea. Beyond that the only limiting factor is your skill with scissors and a hot glue gun. This is a free event but people are encouraged to bring a couple dollars to buy bird feeder decorations from the eclectic collection of recycled craft materials in the SCRAP store. You’ll be amazed at the purchasing power of $3. It was several days of rain (and even a snow flurry or 2) leading up to the Kidical Mass ride on January 21st. There were a few lingering showers the day of the ride but we largely caught a break in the weather and twenty or so folks braved the elements. We met up at West Moreland Park at the prescribed time. The kids played on the playground and chased the ducks while people showed up. Soon enough we were gathered and on our way toward Oaks Park Skating Rink. It was a leisurely 2-mile ride on the quiet streets of West Moreland and Sellwood. We made at least one stop to re-configure kids riding as passengers and perhaps one or two more to tighten up the group. But as is tradition, we rode together as a group, waved at people in cars, and dinged bells for pedestrians. The folks at Oaks Park were kind enough to put out some bike racks right in front of the rink entrance for us. We filled the racks and still had to lock a few bikes to the fence. Most everyone stayed for skating, but there were a couple families with children too small for skating so they headed home after the ride. Those of us who stayed to skate had a blast. Oaks Park (and especially the skating rink) is a gem from a bygone era. If you’ve never been, and if you missed this ride, Oaks Park is worth checking out. How long has it been since you or anyone in your family went went rollerskating? Too long, I’m sure. This is a perfect opportunity to join some fun families for a pleasant bike ride and skating at the historic Oaks Park Roller Rink. We’ll gather at Westmoreland Park playground at 1pm. We ride at 1:15. Our route is on quiet streets through Westmoreland and Sellwood to the Springwater Trail. It’s only a short jaunt on the trail to Oaks Park Roller Rink. The camaraderie of a family bike ride is free but admission to the rink is $5.25/person and skate rentals start at $1.50 (for basic skates… fancy skates are more). The guided ride is one-way. That gives people the most freedom to hang out at the rink and skate as long as they’d like. We ride slowly enough for kids to ride with us. We will be on the road, so kids should be able to follow verbal instructions, stay to the right, and stop/start when necessary. Kids must wear helmets and be accompanied by their grown-ups. Costumes and bike decorations are encouraged but not required. Oh… and don’t forget a lock to secure your bike at Oaks Park. Author Katie ProctorPosted on January 9, 2012 Categories Default3 Comments on Let’s Go Roller Skating! If you were on N Mississippi Ave yesterday, you might be wondering who those family-bike-tastic carolers were. They were the Kidical Mass Carolers of course! We were out for our annual ride to bring family-velo cheer to the good people of Portland. In case you missed it, here’s an account of what happened. We had a tri-generational group… grandma, daughter and granddaughter. Our youngest rider was a 2-year-old on a balance bike who rode the whole 2 miles. Most of the carolers were from that general corner of Portland so we had plenty of local knowledge for safe navigation across arterials. We stuck to quiet streets almost the whole time. One of the “quiet streets” was the alley behind the businesses along Mississippi… it was in a nice paved alley in great shape except for a brief stretch that it was a pot-holed dirt road. Our first performance was at the food cart pod near Mississipi and Skidmore. A few people walking by gave us a “double-take” glance as they walked past but after a handful of songs we decided to ride to our next performance. We moved to the tree in the courtyard near Laughing Planet and Little Big Burger. People there actually stopped to watch us and sing along. A couple of them even snapped a few pictures and clapped. At the peak there were almost as many people watching us as there were singing. The crowd had places to go and things to do so it disipated and it was time to move on. Kids on Bikes, Fa la la. We got back on the bikes and headed toward Grand Central Baking Co. On our way to the bakery, we side-tripped by a house to see what was rumored to be an impressive garden gnome village display in the front yard. Yay for local knowledge! Unfortunately, the gnome village had been replaced by a sign chastising vandals and thieves who had been targeting the display. No more gnome village. Bummer. The bakery was quiet. It seemed a wise career move to revel in the caroling fame we enjoyed in front of the tree and not do a 3rd performance. Most of the KM Carolers hung around the bakery to socialize and warm up with a hot beverage. Me and Mine swung by Little Big Burger for a bite before we pedaled home. A special “Thanks” goes out to Janine for delivering the song sheets. A hodge-podge of BTA carols and KM originals, it’s becoming quite the collection of bike-themed merriment. At one point we took a request for “Frosty the snowman”, which was not on the song sheet. Without the words in front of us it was a pretty sad rendition with more than an adequate share of humming the melody in place of lyrics. It was one of those “what we lack in talent, we make up for with enthusiasm” type situations. Overall it was a great family friendly ride on as warm and sunny a day as one could hope for during December. Baby, it’s cold outside… very, very cold. 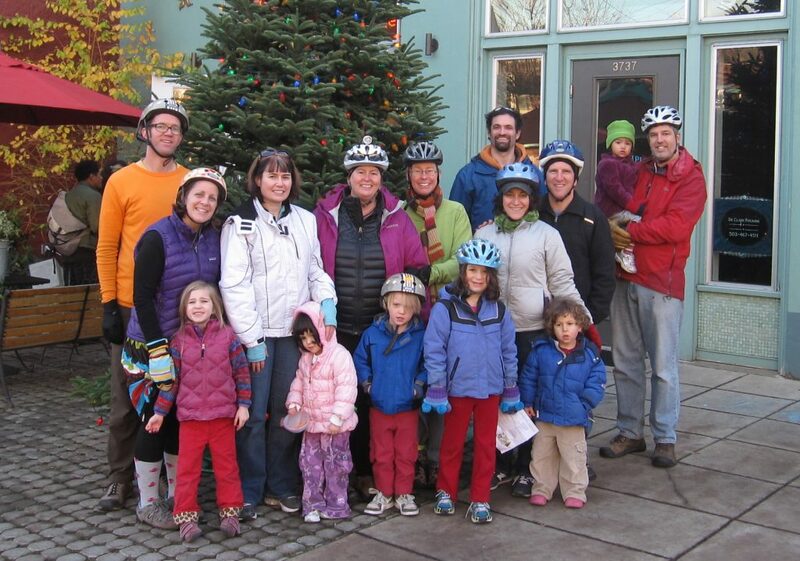 Brighten up your holiday mood by joining Kidical Mass for a ride (whatever the weather) in NoPo this month! Reprising last year’s successful ride, we’ll sing carols (Christmas, bikey, and otherwise) for the holiday shoppers on North Mississippi, and then stop in to Grand Central Baking for some hot drinks and a cookie or three before heading home. Or, hang out for a group supper at Mississippi Pizza! Meet at 1:45 under the covered basketball courts in Irving Park– we’ll leave at 2 and plan to be back by 4. Ride is about 2.5 miles and NOT a loop, but it’s an easy ride back to the start from GCB. Please be sure to bring lights and extra warm layers, so that you and your little ones can enjoy every bikey minute. Holiday outfits aren’t required, but if you’ve got santa hats, elf suits, or reindeer antlers, this would be a good time to wear them. We ride slowly enough for young riders– to ride with us, kids should be able to follow verbal instructions, stay on the right side of the road, and stop at lights & stop signs. Kids must wear helmets & be accompanied by their grown-ups. I’m writing today to ask for your help: Kidical Mass needs a team of people leading rides throughout the city. We need to share our knowledge and skills and distribute some responsibility to create an organization that is robust and sustainable, that draws on a variety of community resources and expands our organizational network. This October would have been our one-year anniversary of taking to the streets of Portland. You may have missed us; if so, I’m sorry. My world of family biking has evolved in the past few months, bringing me a new baby as well as increased pressures in my personal life. Kidical Mass has to survive and expand in Portland to give bike-riding parents and kids a chance to connect with each other, to reassure bike-curious families that people are out living the family bike life every day, and to give newbies a chance to join and learn from those of us who ride all the time. But it can’t survive in its current form: having the ride depend on my getting my act together every month is not working. I face a number of challenges in planning Kidical Mass. First is ride routing: I want the ride to be welcoming to all interested families and so try to move the ride around the city every month. But I’m only familiar with so many parts of town, and exploratory rides are time-consuming and will never give me the familiarity of someone who lives there. In addition, ride turnout declined notably throughout the summer, and while I’m not sure whether the problem lies in poor publicity, poor timing, or unappealing events, having more voices in event planning would add more diversity to the mix and mean fewer rider-less rides. Finally, I’d like to see rides tied in better with neighborhood schools, daycares, swap & plays, etc—I think these are natural places to ‘recruit’ new riders. Kidical Mass needs better connections with these community hubs. I propose that we split the city into six sections, roughly correlating with high school districts. Each section will have a volunteer ride leader to take responsibility for planning, publicizing, and executing two rides a year (or a team of leaders collaborating on those rides). We can coordinate via in-person meetings and a ride leaders email list, and I am more than happy to support and mentor new ride leaders—you won’t be on your own unless you want to be. I am in the process of assembling a ride-leader’s manual, a document that can also develop as we grow as an organization. Our funds will continue to be managed by Umbrella, and we can work together to fundraise for the group. Right now, I’m looking for volunteers from each of these districts. I’m attaching a draft schedule for when rides go where—this is open for revision and trading, but it gives us a starting point. If you can take responsibility for one or two rides a year in your neighborhood, please get in touch with me at katie.proctor@gmail.com and we’ll get this new organization underway. I’m really looking forward to this next chapter! Author Katie ProctorPosted on December 2, 2011 Categories DefaultLeave a comment on Kidical Mass Wants You! If you’re a kid, September means back-to-school. But if you’re a bird, it means fall migration. Take a break from hitting the books and join Kidical Mass on September 17th on a ride for the birds—and for some ice cream! We’ll start at 3 pm at Oaks Pioneer Church (SE 5th & Spokane), and first head north to Staccato Gelato for some icy treats. Then we’ll roll back down to the Springwater Trail, which we’ll take up to the Oaks Bottom Wildlife Refuge to take a peak at the birds passing through Portland on their way south. The ride will finish with our bird walk, but the starting point is just half a mile back down the trail. If you like, bring binoculars, scopes, and/or birding guides—or just bring your sharp eyes and curiosity! Kids must wear helmets, raincoats are a good idea this time of year (just in case! ), and you should have a couple of bucks for ice cream. We ride slowly, but kids should be able to stay on the right side of the road, stop at stop signs, and follow verbal instructions. Rain or shine! This ride has two parts. First, a two-mile stint from Peninsula Park to Irving Park, followed by a three-mile leg from Irving Park down to the event. Peninsula Park meet-up time is 10:30; we’ll leave from Irving Park at 11:15. If either of those is on your way (or even if it’s not) come join us! The second annual Fiets of Parenthood, Portland’s premiere test of skill for parents on pedals, will be held at Clever Cycles on Sunday, August 21st. To get there in style, join Kidical Mass in a caravan of family bike fun! This ride has two parts. First, a two-mile stint from Peninsula Park to Irving Park, followed by a three-mile jog from Irving Park south to the event. If either of those is on your way (or even if it’s not) come join us! Ride is 5 or 3 miles, depending on where you start. Meet at SE corner of Peninsula Park at 10:30, or by the Irving Park playground at 11:15. Kids must wear helmets. Bring water, snacks & sunscreen.